The largely complementary attachment theories of John Bowlby (1969) and Rudolph Schaffer (Rudolph Schaffer & Peggy Emerson, 1964; Schaffer, 1996) mostly focus on the conscious cognitive and affective aspects of the formation of an attachment bond between the child and its primary caregiver (usually the mother), being in broad agreement that this is usually in place by the time the child is 6-7 months old. 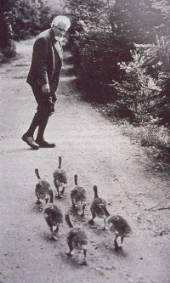 Konrad Lorenz being ‘mother’ to a gaggle of goslings! While the work of Lorenz and other ethologists supported Bowlby’s idea of the newborn being genetically programmed to attach to its mother or primary caregiver, there is clearly a huge gap in psychological functioning between geese and humans – not least that goslings are precocial and need to attach pretty much instantly or they are likely to wander away from the protection of their mother. In contrast, human infants struggle to even sit up before they are 6 months old. However, evidence has increasingly emerged – much of it biological or biological/environmental interaction – that human babies are programmed to attach to their mother, both pre-natal and post-natal. Hepper (2000) said: ‘Being able to attach to your mother through sound and smell has a distinct advantage. After all, you can’t see your mother from inside the womb!” Effectively, being able to recognise your mother is a BEIGE level survival mechanism. H Haynes, B L White & R Held (1965) determined that the focal length of a baby’s eye under a month old is fixed at around 8 inches – the approximate distance of a baby’s face from its mother’s while breast feeding. This means the baby becomes familiar with the mother’s face while having a vital and pleasurable experience (feeding). This would complement Behaviourist explanations of attachment – eg: John Dollard & Neal Miller (1950) – which focus on feeding as the principal driver in attachment. Early physical contact – ‘skin to skin’ contact – between baby and mother is essential for bonding. Marshall Klaus & John Kennell (1976) state that the first bonding must take place within 6-12 hours or a bond might fail to develop. They found that mothers who cuddled their babies more the first 3 days of life and had more direct eye contact with them enjoyed better relationships with their child than mothers whose only contact with the child was for breastfeeding. From their studies Klauss & Kennell concluded that there is a ‘critical period’ for bonding 6-12 hours after birth. Colwyn Trevarthen (1979) proposes that this critical period is time-limited because the surging hormonal changes at birth and immediately after in both mother and child facilitate bonding. Failure to bond during this surge makes it less easy to bond afterwards. Effectively, this biological activity enables the PURPLE vMEME to develop for its first relationship. These findings are supported by Peter De Chateau & Britt Weinberg (1977) who found that mothers who had skin-to-skin contact with their unwashed babies immediately after birth and also immediately put the baby to their breast to suckle, subsequently engaged in significantly more kissing and embracing with their infants. They also breastfed 2-5 months longer. The work of Klaus & Kennell and De Chateau & Weinberg led to changes in the way midwives dealt with the baby at birth. Rather than clean up the newborn and then present it to the mother, it is now accepted practice for the baby’s eyes and airways to be cleared and then given to the mother as quickly as practical, to disrupt the bonding process as little as possible. Breastfeeding is an important part of the attachment process. Linda Smith & Mary Kroeger (2004) found that breastfeeding within the first hour of birth enables the baby to distinguish the smell of its mother’s milk from another woman’s. Much research has centred on the important role breastfeeding plays in setting up the baby’s immune system. For example, Lars Hanson (2004) found the mother’s body makes antibodies in her milk that are specific to her baby’s immune system and its needs. Josef Neu & Sandra Sullivan (2012) even found that the number of white blood cells passed through the mother’s milk increase to help the baby fight off infection when it is ill. There even appears to be a relationship between breastfeeding and behaviour. In a large-scale longitudinal study (over 10,000 mother-child pairs), Katriina Heikkilä et al (2011) found only 6% of breast-fed children exhibited behavioural problems by the time they were 5 compared to 16% of bottle-fed – though the researchers were unsure how much this may be due to fatty acids, growth factors and hormones in breast milk helping with growth of the brain and nervous system and how much was due to closer physical interaction between child and mother. Either way, the effect of early mother-child interaction on later behaviour supports Bowlby’s Continuity Hypothesis. There is a cultural vMEME harmonic of ORANGE and GREEN which promotes the bottle as a sometimes preferential way to feed babies – as illustrated by Bryony Gordon’s 2014 article, ‘Is Breast really Best?’, in the Daily Telegraph. GREEN’s egalitarian tendency leads it to oppose the stigma so often attached to women who cannot – or choose not to – breast feed while ORANGE commercial interests want to sell lots of formula milk. How ever frustrating and distressing it may be to some women who are unable to sustain it, the weight of evidence attaches considerable importance to breastfeeding for the baby’s health, both physically and emotionally. This is the beginning of a social and cognitive relationship between the mother/caregiver. From birth babies have periodic ‘alert phases’ and signal that they are ready for interaction. Ruth Feldman & Arthur Eidelman (2007) note that mothers typically pick up and respond to infant alertness around two-thirds of the time. According to Bowlby (1988), the infant elicits caregiving from its mother-figure by means of social releasers – behaviours such as cooing, smiling, crying or simply looking appealing (cute face) – which encourage a response. Bowlby believed human beings are innately programmed to respond to such social releasers. Bowlby considered social releasers critical in the forming of attachments. Peter Wolff’s (1969) research provides support to Bowlby. He identified 3 types of cry that babies make. The ‘basic’ (half-second rhythmic cries interspersed with silences of around 0.6 seconds) signals hunger. The ‘angry’ is similar to the basic but has shorter periods of silence. The ‘pain’ is a loud initial cry followed by breath holding. Parents respond to the baby’s cries with a range of behaviours designed to nurture, soothe and distract the baby, such as feeding, stroking, rocking and singing. Daniel Stern (1977) notes that babies have an innate predisposition to look into their caregiver’s eyes, look away and look back again in a kind of rhythmical dance. In 1989 Russell Isabella, Jay Belsky & Alexander von Eye found that securely-attached mother-infant pairs were those who had shown more instances of interactional synchrony in home observations during the the first year. Andrew Meltzoff & Keith Moore (1977) observed the beginnings of interactional synchrony in babies as young as 2 weeks old. Using independent analysis of filmed adult-child interactions, an association was found between the expression or gesture the adult had used and the actions of the babies. Such early beginnings of interaction support the concept that it is innate. Lynne Murray & Colwyn Trevarthen (1985) deliberately interfered with this interactional turn-taking by getting mothers to adopt a ‘frozen face’ expression with their babies. The babies showed serious distress by turning away from their mother’s face and crying. Moreover, infants make deliberate attempts to draw the mother back into the interaction, suggesting that the infant is an active and intentional partner in the communication. In Integrated SocioPsychology terms, PURPLE’s need for safety in belonging is disrupted, causing embryonic RED to try to take control of the mother and re-establish the interaction. If the attachment process is biologically driven in origin, what happens if that process is disrupted either before birth or at birth? The balance of evidence in the literature – notably James Plunkett et al (1986) and Sarah Mangelsdorf et al (1996) – indicates there are often attachment issues for premature babies. Moreover, the more premature and the lower the birth weight the more likely there problems with bonding – 1500 grams and a gestational age of 30 weeks seeming to provide some kind of rough threshold. Moreover, Plunket et al and Mangelsforf et al found early problems in mother-infant bonding may become more pronounced over time. Mark Greenberg, Heather Carmichael-Olson & Keith Crnic (1992) found relatively-secure attachment patterns in premature children at age one year, yet found insecure attachment patterns in the same group some 4 years later. If the biologically-driven attachment process is disrupted for premature children, at least they are usually raised in loving environments by their natural parents. In babies who are taken from their mothers at birth to be put up for adoption, the process is effectively terminated. Nancy Newton Verrier (1993, p15) writes that babies “scream their outrage” when they are taken from their birthmothers and put in a nursery unit. When they are given to the adoptive mother, she doesn’t smell or sound ‘right’. The child is unable to make that necessary primeval connection to this alien person. The PURPLE vMEME’S need to be safe in belonging will eventually enable the child to form a bond with a nurturing adoptive mother – though the lack of biological connection will often trouble the relationship. (Interestingly, Verrier notes that adoptive fathers often have better relationships with their children than do the adoptive mothers.) These relationships are often so troubled that Verrier wonders if being raised in care may be preferable to adoption in some cases. Certainly, adopted children’s frustrated drive to bond and their traumatic early experiences may account for why they consistently have greater representation in juvenile delinquency and psychotherapy statistics, are generally more sexually promiscuous, less successful educationally and tend to have more employment problems. Tragically, these facts also lend support to Bowlby’s Continuity Hypothesis. …while clearly there is a biological impetus to attach, frustration of that drive does not necessarily predicate the child to an unhappy life. There are many other factors which can influence the child’s development – eg: the quality of its parenting, other important relationships and, not least, the child’s own temperament. As documented in Separation, Deprivation and Privation, children can – and do! – recover from the most awful beginnings in life, given the biological potential and the right kind of nurturing and loving support.